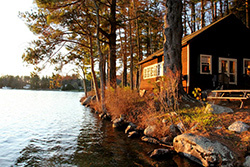 Clearwater Lodges, in Wolfeboro, NH is situated in a grove of tall pine trees on a white birch-studded shoreline, in Winter Harbor on Lake Winnipesaukee. It is one of the finest places of its type in New England, and has built its reputation on exceptional attention to detail. Our fourteen individual rustic housekeeping lodges accommodate fifty guests, and are completely appointed with the best available for easy living. Clearwater Lodges is a family owned and operated business, and has remained so for over 70 years. The family is dedicated to providing a consistently excellent hospitality experience and is eager to accommodate your needs. Clearwater Lodges is opened from mid-May to mid-October.